A split-second decision changed the course of Alex Mitchell’s life and kickstarted an incredible business and life journey. If you want to be inspired to change the course of your life and unleash your potential, this is the episode for you, particularly if you’re a divorced or single parent. Alex Mitchell is an independent book coach, author’s consultant and editor based on a pineapple farm in the Sunshine Coast hinterland, Australia. She has spent the last eight years working with business people to create concise, compelling and comprehensive books that complement their businesses and increase their professional standing. Alex offers one to one coaching to help busy people manage their book projects, as well as small group author workshops and Skype consultations. Your life keeps changing and the demands on your time change all the time, and you’ve gotta change with it. If you don’t back yourself how can other people? Ask people to nominate you for awards. They often do know about them. To entrust your book to someone you really have to know and like them. Have a look at what’s important to you and how far you want to go. What you think people need isn’t always what they want. Find the right angle that your clients need to keep them motivated and accountable. It’s different for everyone. Alex’s big Making the Leap tip: You’ve gotta be doing something you feel strongly about. It’s gotta be something you really want to do. Where I see people come undone is that there’s too much focus on what you love to do but forgetting what the market wants. You can’t force the market to want what you offer. Tweak your offer to fit what the market wants. Reinventing your life is not an easy thing to do. It takes a long time to build a business to the point you are completely independent. It doesn’t happen overnight. 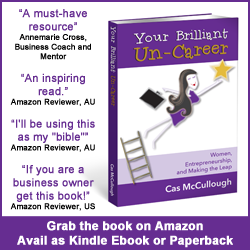 Chapter 2 of Your Brilliant Un-Career talks about creating a business that leverages your expertise over your time. I have done a terrific interview with Sourcebottle’s Rebecca Derrington on this topic that I want you to have. Access this interview for free here, along with 32 other business building podcast interviews, templates, worksheets and motivational affirmations.